The Atlassian Team Calendars team is pleased to announce the release of Team Calendars 1.4. This release focuses on the introduction of edit restrictions and a lot of bug fixes. Team Calendars 1.4 is compatible with Confluence 4.0. Building on View Restrictions in Team Calendars 1.3, Team Calendars 1.4 introduces edit restrictions for your calendars. You can access the Team Calendar 'Restrictions' dialog from any calendar dropdown. Adding view restrictions to a calendar will hide the calendar from the "Popular Calendars" and "Search" dialogs for those users without the appropriate access. If a calendar macro is embedded on a page, users will only see the calendars they have access to. All users with edit restrictions will be able to see and edit the calendar they have access to. If you already have an existing calendar, adding or modifying restrictions can be simply done by selecting 'Restrictions' form the calendar dropdown. 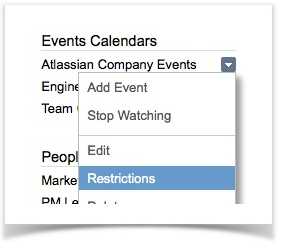 Note: You can apply restrictions to any calendar type except JIRA. 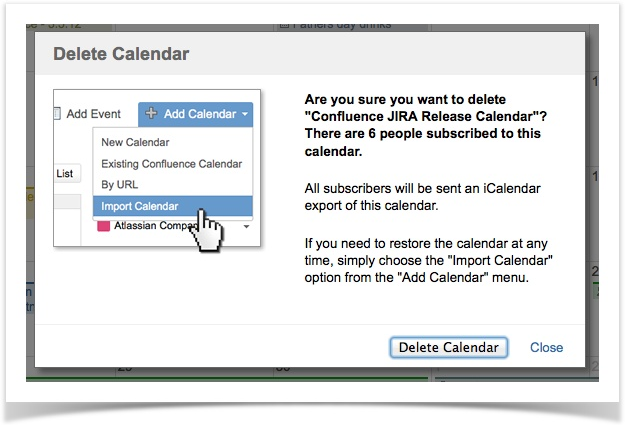 JIRA calendars already applies restrictions inherited from your selected JIRA project. Deleting a calendar now confirms with you the exact calendar name before you delete it. To upgrade to 1.4, simply click 'Upgrade' in the Team Calendars entry of the Plugin Administration screen in Confluence.